Anyone else enjoying Colecovision on the Mega Sg? And let me say one more thing, and this is totally my opinion of course. I hate the current trend of commoditization of games. I hate those FPGA players that just want to play and simulate everything. I think they make a disservice of promoting classic gaming the proper way. Video games are a product of technology, game designers had to create games based on the technology available to them. To put everything under the same umbrella with total disregard to contextualization, proper control method, etc, is just wrong. Very convenient and inexpensive maybe, but still a disservice to what retro gaming means. I for one do not support those multi system players and never will. I don’t want to play a nes game followed by a snes game running from a generic box using a generic controller. In fact if I wanted I have a Mac for that. That is why o hope, and again this is just my opinion, that the Phoenix sticks to one or just a couple of systems. It is better to do something very well than to do many things poorly. Remember that “casual” players don’t stick with you, they move easily to the “next big thing”. My two cents. Of course others may have very different opinions, that is fine too. I would play homebrew games on Mega SG than the original games released between 1982-1988 because you need to use keypad to start to play. Edited: good thing, this topic is cleaned up. It was a mess. The mega sg has a way to access the keypad but it uses button combos. There's no reason they couldn't map keypad buttons to genesis controller buttons. That could make games like spy hunter and mousetrap playable. And the sega master system does have a trackball should they want to implement it. If it doesn't map all four super action buttons it should e.g. frontline. It's not clear if the support for original colecovision controllers is a physical limitation or something that's just not implemented. That is what I mean, just don't support this CV core. It has a very suspicious origin and can only damage ongoing projects from people that have been truly supporting the ColecoVision community for years. If you want to play CV cartridges, get a Phoenix. It has a licensed SGM. Nothing wrong with asking for people's support but what's wrong with the origin of the mega sg colecovision core? Edited by mr_me, Wed Apr 3, 2019 11:14 AM. Mega Sg has the keypad configured via different combinations on a 6 button controller. You can play all the original games no problem. As a casual (at best) Coleco fan, you will get a casual (at best) support and attention for your Coleco needs from a readily-available product that does many things, but that being a ColecoVision isn’t the primary focus (not even close). If that is what you are paying for, I don’t see why it shouldn’t work for you. Multi-purpose devices have had a long history of giving you a bunch of functions in one device, but none of them great. Having worked in IT for 20+ years I remember when the first all-in-ones came out (printer/fax/scanner) and they did their jobs for the most part (not much to a FAX, really) but you didn't get the best print jobs, the fastest print jobs, the highest resolution scans etc. etc. They have gotten better as the years have gone by, and I know a lot of people still swear by them, but none of them will give you the best of the best of the best like a dedicated, high end device will. They're good, but not great. Same thing with these multi-play systems - they're good but often gimmicky (my Retron 5 is not even collecting dust on a shelf - its packed away in its box). I consider myself a casual fan of everything, when it comes to gaming, but I still prefer a dedicated machine when it comes to playing most anything, as opposed to a multi-game machine. Well its a good thing Mega Sg is an example of a product that does many things very well and it will only get better with future firmware updates. It would be cool if a future JB offered another core like 2600, but that is just me being greedy. Coleco was already a huge surprise for me and in its current state I'm extremely happy with my purchase. FPGA systems make things so much easier when you want to play on an HDTV. No expensive mods or external scalers necessary. Basically just plug n play and you get a hight quality experience. Speaking of which, anyone have some good Coleco game recommendations? Perhaps more of the underrated titles. Gateway to Apshai. War Games. War Room. I don't know about you guys but I must say I prefer the SG-1000 port of Q*bert over the Colecovision for one major reason, controls. 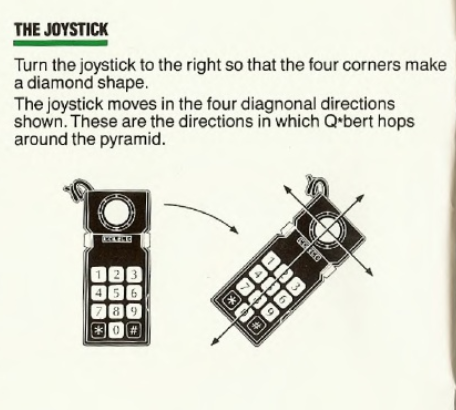 With SG-1000 you can just use diagonals on the D-Pad to jump to each box making things much easier. Its too bad because the Colecovision port does look and sound better. If only someone were to make a hack of the Coleco port so you can just use diagonals. Once you play a few rounds you get used to the controls. Hahahah, nice that actually helped out. Those instructions don't work well for lefties.